I am always looking for a new mystery "hook". Bookseller and librarian protagonists are favorites, looking for insider tics. This author takes it up a notch, detailing the daily woes of a middle aged editor for a small book publisher. "I like the pacing, the puzzle, and the protagonist. The ending is quite satisfying. Most of all, I like the voice. Sam is, as previously noted, smart. She is also caring and funny. She can be snarky, but usually only inside her own thoughts. I'd love to spend more time with her. Fingers crossed we all will have the chance." -- Debbie Meldrum of FRESH MEAT featured in CRIMINALELEMENT.COM. Yes... there are more in the series. It's just another day at the office for London book editor Samantha "Sam" Clair. Checking jacket copy for howlers, wondering how to break it to her star novelist that her latest effort is utterly unpublishable, lunch scheduled with gossipy author Kit Lowell, whose new book will dish the juicy dirt on a recent fashion industry scandal. Little does she know the trouble Kit's book will cause-before it even goes to print. When police Inspector Field turns up at the venerable offices of Timmins & Ross, asking questions about a package addressed to Sam, she knows something is wrong. Now Sam's nine-to-five life is turned upside down as she finds herself propelled into a criminal investigation. Someone doesn't want Kit's manuscript published and unless Sam can put the pieces together in time, they'll do anything to stop it. 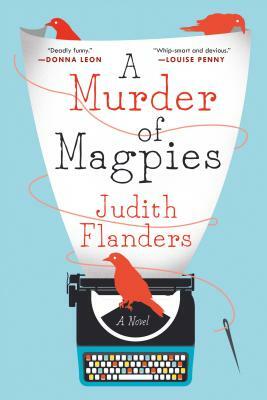 With this deliciously funny debut novel, acclaimed author Judith Flanders introduces readers to an enormously enjoyable, too-clever-for-her-own-good new amateur sleuth, as well Sam's Goth assistant, her effortlessly glamorous mother, and the handsome Inspector Field. A tremendously entertaining read, this page-turning novel from a bright new crime fiction talent is impossible to put down.